Savu C. Savulescu, PhD, has more than thirty years of experience in computer engineering, utility operations, planning, and control. Currently CEO of Energy Consulting International, Inc., he has worked predominantly in the design and implementation of utility information systems, such as SCADA/EMS, and developed stability assessment software that is being used in real-time and off-line in the U.S., Europe, Latin America, and Asia. 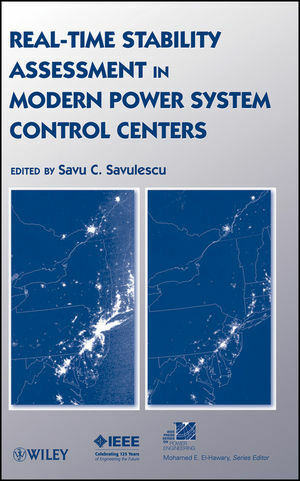 Dr. Savulescu has taught electric power systems and computer sciences at major universities in Belgium, Brazil, and the U.S.
1 The Real-Time and Study-Mode Data Environment in Modern SCADA/EMS (Sudhir Virmani and Savu C. Savulescu). 1.3 Integrating Stability Applications with the SCADA/EMS. 2 Overview of Key Stability Concepts Applied for Real-Time Operations (Savu C. Savulescu). 2.2 In Search of the Stability Limits. 2.3 Transient and Voltage Stability Limits. Annex 1-1. Reactive Power Steady-State Stability Criterion dΔQ/dV. 3 LIPA Implementation of Real-Time Stability Monitoring in a CIM Compliant Environment (Loris Arnold, Janos Hajagos, Susan M. Manessis, and Anie Philip). 3.2 Static and Dynamic Security Assessment at LIPA. 3.3 Benchmarking the Real-Time Stability Application. 3.4 Practical Experience and Outlook. 4 Real-Time Stability Monitoring at the Independent System Operator in Bosnia and Herzegovina (Dusko Vickovic and Roland Eichler). 4.2 Interim Implementation of Real-Time Stability Assessment at NOS BiH. 4.3 Real-Time Stability Assessment in the New SCADA/EMS Environment. Annex 4-1. TSL, TTC, and the Stability Envelope. Annex 4-2. Siemens Implementation of the Continuation Power Flow. 5 Experience with Real-Time Stability Assessment at Transelectrica (Horia S. Campeanu, Cornel Erbasu, and Cornel Aldea). 5.2 Security Assessment Philosophy and Criteria. 5.3 Real-Time Steady-State Stability Assessment and Monitoring. 5.4 Off-Line Stability Tools in Support of System Operations. 6 Implementation of Online Dynamic Security Assessment at Southern Company (Kip Morison, Lei Wang, Fred Howell, James Viikinsalo, and Alan Martin). 6.3 Transient Security Assessment Implementation at Southern Company. Annex 6-1. Further Details of the DSA Software and Hardware Architecture. Description of the Core DSA Software. Online DSA Implementation Using DSATools. 7 Online Security Assessment for the Brazilian System?A Detailed Modeling Approach (Jorge L. Jardim). 7.2 Security Criteria and Functions. 7.3 Solution Methods and Architecture. 7.5 User Interface And Performance. 8 Dynamic Network Security Analysis in a Load Dispatch Center (Guenther Beissler, Olaf Ruhle, and Roland Eichler). 8.2 Siemens Approach to Dynamic Security Assessment. 8.3 Case Studies: Challenges, Implementation Approach, and Solution Features. Annex 8-1. Further Dynamic Simulation Capabilities. Time Frame for Dynamic Simulations. Simulation in the Frequency Domain. 9 Real-Time Transient Security Assessment in Australia at NEMMCO (Stephen J. Boroczky). 9.2 Transient Security Assessment at NEMMCO. 9.4 Experience, Benefits, and Outlook. 10 Online Voltage Security Assessment in the Hellenic Interconnected System (Costas Vournas, George Christoforidis, and Thierry Van Cutsem). 10.2 The Control Center of HTSO. 10.3 Online VSA in the Hellenic System. 10.4 Use of Online VSA For Arming Load-Shedding Protection. Principle of the QSS Approximation. Handling of Frequency in QSS Simulation. QSS Model of the Synchronous Machine and its Regulations. Numerical Integration of the QSS Model. 11 The Real-Time Supervision of Transmission Capacity in the Swedish Grid (Lars Sandberg and Klas Roudén). 11.2 Prior and Current Application Development at SVK. 11.3 Voltage Security Assessment with SPICA. 11.4 Benefiting from the Knowledge of the Current Transmission Capacity. Appendix A Dimo?s Approach to Steady-State Stability Assessment: Methodology Overview, Numerical Example, and Algorithm Validation (Roberto D. Molina Mylius, Martín Cassano, and Savu C. Savulescu). A.2 Numerical Example?Independent Testing of Algorithm Implementation. Appendix B SIME: A Comprehensive Approach to Transient Stability (Mania Pavella, Daniel Ruiz-Vega, and Mevludin Glavic). Appendix C Detection and Evaluation of Stability Constrained (Marius Pomarleanu and Savu C. Savulescu).